Mike Haselden (left) celebrates with the Portsmouth franchisee, Steve Thatcher, winner of the High Performer award for the Southern region. Revive! the smart vehicle repair franchise reported at its annual conference that it had a milestone year with a 45 per cent rise in national accounts and achieving an annual turnover of over £10m. Mark Llewellyn, managing director of Revive! said that almost 70 per cent of franchisees had record months and over 50 per cent of the network achieved their highest annual sales. The East Anglian team was highlighted for hitting its £1m target several months earlier than expected. Terry Mullen, operations director and Cathryn Hayes, franchise director gave a presentation to attendees showing the company’s performance during 2017. The company reported growth from national accounts work and fleet management companies, which saw repairs nearly, double, with over 2,500 repairs being processed in October alone. Mike Monaghan, the founder of the Motor Vehicle Repair Association was the keynote speaker who shared his motivational success story and Andrew Jordan, the British Touring Car Championship driver sponsored by Revive! gave a preview of his team’s plans for the 2018/19 season. 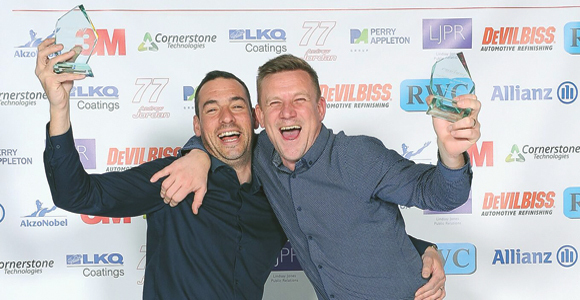 The event also included an awards ceremony where its franchisee for Chester, Mike Haselden was a double award winner, taking the High Performer award for the Northern region, achieving 40 per cent growth during 2017 and the title of Franchisee of the Year. Revive! currently has 60 franchisees, 19 company managed technicians and 161 vans on the road offering its mobile smart repair service to car dealerships, fleet and lease companies, insurance companies as well as the general public.